The Manchester Millennium Bridge is a 95m vertical lift bridge bridge spanning the Manchester Ship Canal. 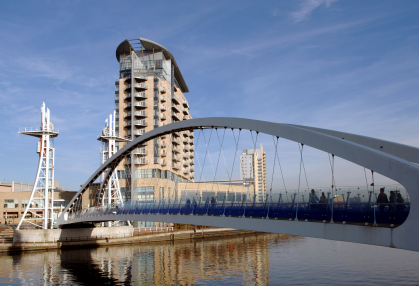 Completed in 2000, the Millennium Bridge is located near the terminus of the canal at the old Manchester Docks and links the Lowry Centre to Trafford Wharfside. The bridge has a total lift of 18 metres and can be raised or lowered in less than three minutes.